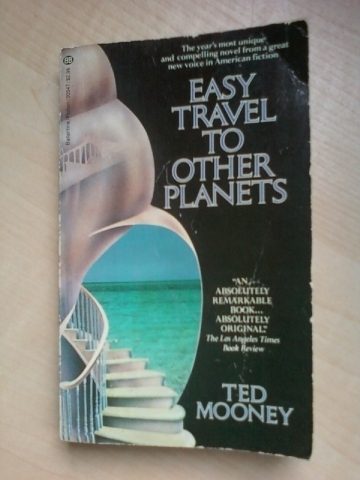 I feel like I didn’t do my homework before I wrote In Praise of Ted Mooney, Part 1: Easy Travel to Other Planets. In his Acknowledgments, Mooney mentions that the explanation of sonar that Melissa, the novel’s dolphin researcher, provides, is based on a passage in John Lilly’s Lilly on Dolphins (1975). Had I looked at Lilly’s writings then, I would have known that there was a real world researcher who lived in a flooded house in St. Thomas with a dolphin named Peter for ten weeks trying to teach him to communicate in English. John C. Lilly, MD (1915-2001) was a fascinating character. A neuroscientist by training, he invented isolation tanks that shut out as much as possible all sensory input to see what how the mind would react, and then began experimenting with LSD as he floated in the tanks. Following these experiences, he began studies of interspecies communication with dolphins. This led in the 1970s to the JANUS (Joint Analog Numerical Understanding System) project, which used computers to facilitate communication, but at the time the technologies were not adequate for the purpose, and, moreover, Lilly became uncomfortable treating dolphins as captive experimental subjects. His interests in the last decade of his life were oriented towards the intersection of neurobiology and theology. In my previous post, I mentioned a few of the ways in which the world depicted in Ted Mooney’s Easy Travel to Other Planets differs from ours. One of these, a new illness called “information sickness,” has captured more critical attention than any other facet of the novel, including Melissa’s romance with the dolphin Peter. In fact, if you search for articles about the book, allusions to information sickness as prophetic for its time (1981) is nearly all you’ll find. While information sickness and the colonization of Antarctica are details in Easy Travel, in Mooney’s second novel, Traffic and Laughter (1988), the most striking difference is central to the story: the United States did not detonate an atomic bomb at the end of World War II. We know the war was fought because one of the lead characters, Michael, is designing the special effects for a movie set in the Pacific theatre. This summer Knopf published Ted Mooney’s fourth novel, The Same River Twice. It’s the best novel I’ve read this year, and it sent me back for another look at his three previous works: Singing Into the Piano (1998), Traffic and Laughter (1990), and Easy Travel to Other Planets (1981), a novel I fell in love with the first time I read it, nearly thirty years ago. I couldn’t connect with the characters of Singing Into the Piano. The other three are exceptional but under-rated, and in my next several posts, I’m going to tell you why they are so good. They are suspenseful, well paced, stylistically original, well-plotted novels about intriguing characters and provocative ideas. Mooney’s first, Easy Travel to Other Planets, is on several levels his most experimental (not in this case a euphemism for unreadable, by any means). Melissa has been living in a “flooded house” in the Caribbean and teaching Peter, a dolphin, how to talk. On the morning of her departure for home to visit her terminally ill mother, Melissa and Peter become lovers, in every sense of the word. Easy Travel takes place in a slightly different world than our own, or perhaps a few years into the future (beyond 1980). The world is about to go to war over control of natural resources in Antarctica, including the “last set of relatively quiet airwaves on earth” (77), and a new illness is feared: “information sickness.” Its symptoms include “deliriously disconnected speech,” the “desire to touch everything,” and an inability to “tell where one thing left off and the next began” (34). But pay phones are still used, and while reports claim that “seventy-two billion new pieces of information were created yearly” (80), no one has a personal computer. And there’s not yet travel — easy or otherwise — to other planets. So why this title?